1920: (David R) Davis-(Donald Wills) Douglas Airplane Co, Wilshire Field, Santa Monica CA. 1925: Douglas Aircraft Co, 2435 Wilshire Blvd, Santa Monica CA; 1929: Clover Field, Santa Monica CA. 1931: Douglas Aircraft Co Inc, Santa Monica CA. 1932: Northrop Aircraft Corp as subsidiary. 1940: Douglas Aircraft Co Inc, El Segundo CA. 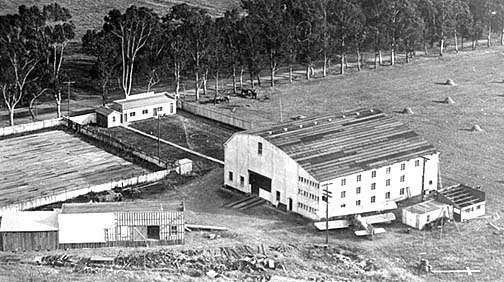 1962: El Segundo plant remanded to USN. 1967: McDonnell Douglas Corp, Long Beach CA. 1997: Acquired by Boeing Co. 2006: Douglas operations ended on Boeing's closure of the Long Beach plant with final assemblies of the 717 (MD-95), leaving a skeletal clean-up staff until 2008. 640 - Design proposal by Ed Heinemann for USN submersible submarine-launched fighter based on modified A4 Skyhawk never went past the paper stage. SEE Airplanes Under Water. 1-X 1938 = 2pClwM; 750hp P&W R-1535 Wasp; span: 41'6" length: 31'8". POP: 1 rebuilt from the last USN BT-1 with tricycle gear for carrier trials. Damaged in a ground accident, it was sold back to Douglas Co [NX18995]. 7, 7A, 7B SEE A-20. 8A - Douglas development of Northrop A-17 as 2-3pClwM export models with various engines; span: 47'9" length: 31'6" to 32'9" load: varied v: 219-260/190-205/66 range: 910-1380. Four .30 wing guns, one .50 flexible gun in rear cockpit. 8A-1 1938 = 875hp Bristol Pegasus. POP: 1 (c/n 378) to Sweden as a pattern for licensed manufacture there by Svenska Aeroplan AB, who installed a 875hp Bristol Pegasus and redesignated it model B-5A (later B-5D). 64 were built in 1940 as B-5B and 39 with 980hp Bristol Hercules XXIV as B-5C. 8A-2 1938 = 700hp Wright R-1820G-3 and external bomb racks. POP: 30 (c/ns 348/377) exported to Argentine Army as [401/430] (prefix "A-" added in the early 1940s). 8A-3P 1938 = R-1820G-3. POP: 10 to Peru (c/ns 412/421). 8A-3N 1939 = 1050hp P&W R-1830-SC3G. POP: 18 to the Netherlands (c/ns 531/548). 8A-4 1940 = 800hp Wright R-1820G-103. POP: 15 to Iraq (c/ns 613/627). 8A-5 1940 = 1200hp Wright GR-1820G-205 Cyclone; two added .50 guns in wing pods, twin .50s in rear cockpit, bomb racks under wings (1200# load) and in fuselage bomb bay (600#). POP: 36 ordered by Norway (c/ns 715/750), but only 5 delivered as trainers to Norwegian AF Tng Ctr in Canada when Germany overran their nation. The remaining 31 were requisitioned by USAAF as A-33 in 1942. BD 19?? = Unarmed XF-3 and A-20B repowered with two 1600hp Wright R-2600-3, transferred to USN for target towing and utility runs. POP: 1 XF-3 as BD-1  and 8 A-20D as BD-2 [7035/7042]. 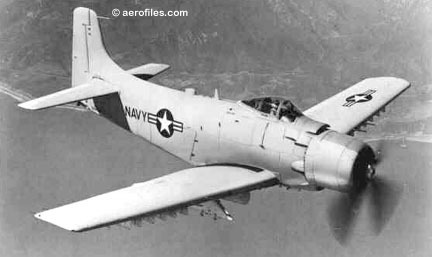 A-1 Skyraider - Redesignated in 1962 from AD (qv for data). A-1E 1962 - Redesignated from AD-5. EA-1E 1962 - Redesignated from AD-5W. EA-1F 1962 - Redesignated from AD-5Q. A-1G 1962 - Redesignated from AD-5N. A-1H 1962 - Redesignated from AD-6. In what was probably the first prop-vs-jet victory, while covering a rescue operation on 6/20/65, two A-1Hs of VA-25 (CVA-41 Midway) piloted by Lts Charles Hartman  and Clinton Johnson  were beset by a flight of MiG-17s and, in a joint head-on attack with their 20mm cannon, they downed one of the MiGs. Both shared a half-kill for their victory. On 10/9/66, this feat was duplicated by Ltjg William Patton of VA-176 (CVS-11 Intrepid) when he downed a MiG-17 near Hanoi with his A-1H . A-1J 1962 - Redesignated from AD-7. 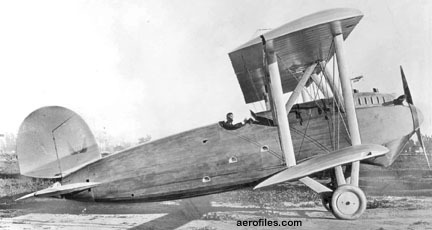 A-2 1926 = Converted from O-2 with experimental air-cooled, inverted 420hp Liberty V-1410; span: 39'8" length: 29'7" load: 1566# v: 128. 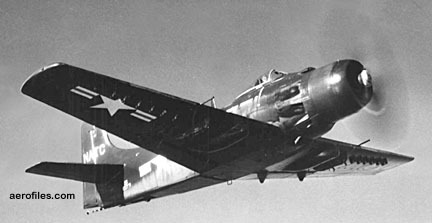 First of the USAAC A for Attack (XA-1 designation had been used once by a Cox-Klemin air ambulance), unique for the time were the four machine guns in its top and bottom wings. POP: 1 as XA-2 [25-380], for Army evaluation tests against Curtiss XA-3, to which it lost out. A-3 Skywarrior - Redesignated in 1962 from A3D. SEE ALSO B-66. A-3A 1951 = From A3D-1. POP: 143. EA-3A 19?? = POP: 5 conversions. A-3B 1956 = Electronic countermeasures, redesignated from A3D-2; span: 72'6" length: 76'4" v: 610 range: 1050 ceiling: 41,000'. POP: 174. 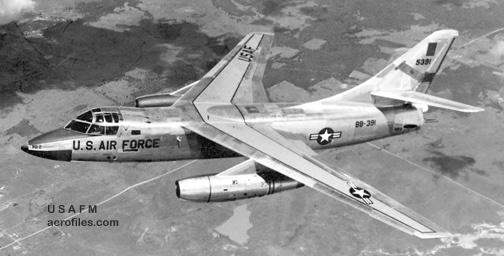 EA-3B 1958 = From A3D-2Q. 4p; ff: 12/10/58. POP: 13. KA-3B 1966 = Tanker. POP: 50. EKA-3B 1967 = 3p modification for TACOS (Tanker Aircraft Countermeasure Or Strike). POP: 39. RA-3B 1959 = 5p photo-recon version, redesignated from A3D-2P. POP: 27. ERA-3B 19?? = TACOS conversion (see EKA-3B). NRA-3B 19?? = Test-bed modification for Harpoon and Cruise missile guidance system. TA-3B 1959 = From A3D-2T. 2p navigation and bombing trainer. POP: 12. VA-3B 1959 = Modified electronics equipment. YA-3D 195? = Redesignation from YA3D-1 . A-4 1940 = Target drone conversion of BT-2; initially BT-2BR when radio-controlled by -2CR as controller planes. POP: 17 [scattered s/ns in the 31-1/135 block]. Those target planes had tricycle gear, were painted red and silver, and bore no national insigniait didn't look good to shoot down one's own planes. A-4 Skyhawk - Redesignated in 1962 from A4D. Boasting of a longer production life than any other type of combat aircraft in the Free World, the compact Skyhawk was the Navy's and Marines' standard light-attack fighter for nearly 20 years. POP (total A-4): 2,960 reported. 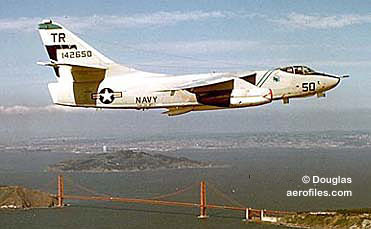 A-4A 1962 = Redesignated from A4D-1. A-4B 1962 = Redesignated from A4D-2. A-4C 1962 = Redesignated from A4D-2N. A-4D - Designation not used to avoid confusion with the pre-1962 A4D. A-4E 1962 = Redesignated from A4D-5; 8500# P&W J52-P-6A; span: 27'6" length: 41'2" v: 673 range: 1160; ff (as A4D-5): 7/12/61. POP: 117 [151984/152100]. TA-4E 1965 = 2p tandem trainer with raised rear cockpit; ff: 6/30/65. POP: 2 [152102/152103]; production units became TA-4F. A-4F 1966 = Last USN attack version, with 9300# J52-P-8A; length: 42'6"; ff: 8/31/66. New ejection seat. POP: 147 [152101, 154172/154217, 154970/155069]; 2 were modified to A-4M for prototypical testing [155042, 155049]. TA-4F 1966 = Trainer. POP: 240 [152846/152878, 153459/153531, 153660/153690, 154287/154343, 154614/154657, 155070/155071], of which 2 to Australia [154647/154648] and 23 modified as OA-4M. A-4G 1984 = Exports to Australian Navy. POP: 16 [154903/154910, 155051/155053, 155060/155063, 155069]. TA-4G 1984 = Trainer (Australia). POP: 2 [154911/154912]. A-4H 1967 = Exports to Israel. POP: 90 [155242/155289, 157395/157428, 157918/157925]. TA-4H 1967 = Trainer (Israel). POP: 25 [157429/157434, 157926/157929, 159546/159556, 159795/159798]. TA-4J 1969 = Trainer. POP: 291 [155072/155119, 156891/156950, 158073/158147, 158453/158527, 158712/158723, 159099/159104, 159546/159556, 159795/159798]. A-4K 1969 = Exports to New Zealand. POP: 10 [157904/157913]. TA-4K 19?? = Trainer (New Zealand). POP: 4 [157914/157917]. A-4KU 1976 = Exports to Kuwait. POP: 30 [160180/160209]. TA-4KU 1976 = Trainer (Kuwait). POP: 5 [160210/160215]. A-4L 1969 = 100 A-4C upgraded for USNR units with 8400# Wright J65-W-20 and new avionics, wing spoilers; ff: 8/21/69. A-4M 1970 = USMC. 11200# P&W J52-P-408A; length: 40'4" load: 14,035# v: 670 range: 2055 ceiling: 38,700'; ff: 4/10/70 (p: Walter Harper). Enlarged canopy, onboard engine starter, increased ammo and electrical generation. POP: 158 [158148/158196, 158412/158435, 159470/159493, 159778/159794, 160022/160045, 160241/160264]. OA-4M 1978 = USMC. TA-4F modified for use in high-speed reconnaissance and tactical FastFAC (Fast Forward Air Controller). POP: 23. A-4N Skyhawk II 1972 = Exports to Israel, with new electronics and 30mm cannon retrofit; ff: 6/12/72. POP: 117 [158726/158743, 159035/159052, 159075/159098, 159515/159545, 159799/159824], of which 32 were sold to Indonesia. A-4P (Douglas Tulsa, Lockheed) 1966 = Refurbished A-4B exports to Argentina. POP: 75. A-4PTM, TA-4PTM (Grumman) 1979 = Refurbished A-4C/-4L to Malaysia. POP: 25 A-4C and 63 A-4L, plus 6 modified as 2p TA-4PTM trainers in 1984. EA-4P 19?? = Electronics countermeasure. A-4S (Lockheed) 1974 = Refurbished surplus A-4B; exports to Singapore. POP: 40. TA-4S (Lockheed) 1975 = Refurbished surplus A-4B as trainer for Singapore. POP: 7. 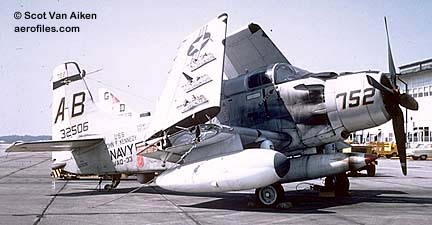 A-4Y - Originally planned for A-4Ms modified with Hughes ARBS system, but not used. A-6 1940 - Proposed O-38 for use as radio-controlled aerial target. Not implemented. A-8 Harrier II 1970 = USMC temporary designation for AV-8. A-20 Havoc, DB-7, F-3 - USAAF and export attack bomber. 3-4pChwM rg. Began as 1937 John Northrop design study as Model 7 prototype and 7A export version with two 450hp P&W R-1830, neither of which was built, but underwent a major redesign as 7B. A-20 production also by Boeing Co. SEE ALSO P-70. 7B 1938 = 3pChwM rg; two 1100hp P&W R-1830SC; ff; 10/26/38 (p: Carl Cover). Ed Heinemann. POP: 1, crashed in testing. DB-7 1939 = First production; ff: 7/13 (?>17)/39 (p: Carl Cover). Ed Heinemann, Leo Devlin. A few planes were modified with twin rudders, but this idea proved impractical and was abandoned. "DB" designation was assigned by the French Purchasing Commission for their Model 7s. POP: 270 ordered by France, but after its fall, most were diverted to RAF. DB-7A 1939 = 1600hp Wright R-2600-A5, strengthened landing gear. To RAF as Havoc II; ff: 12/26/38. POP: 100. DB-7B (Douglas, Boeing) 1939 = Glazed nose, .303 machine guns, armor, and self-sealing tanks. R-2600; length: 46'11" load: 4600# v: 314/270/81 range: 630 ceiling: 28,550'. POP: 781 originally ordered by France as DB-7A (with 240 built by Boeing), of which 300 to RAF as Boston III, of which 15 became Boston I trainers, and 147 as Boston II night fighters (after US entered the war, some of the DB-7Bs went to USSR, and some to USAAF as A-20A). DB-7C 1939 = Torpedo racks, glazed nose. POP: 48 to Dutch East Indies, but about half of them went into the Lend-Lease pool. A-20 1940 = 1700hp supercharged Wright R-2600-7. POP: 63 [39-721/797], of which 1 converted to prototype XP-70 night fighter [39-735] and 59 to P-70s; 3 became YF-3 photo-recons [39-741, -745, -748]. A-20A 1940 = Non-supercharged; two 1600hp Wright R-2600; span: 61'4" length: 47'7" load: 4585# v: 347/295/85 range: 675. $163,813; POP: 143, of which 129 to USAAF [40-071/179, -3143/3162], and 1 to USN as BD-1 [39-741=4251]; 17 converted to A-20B. 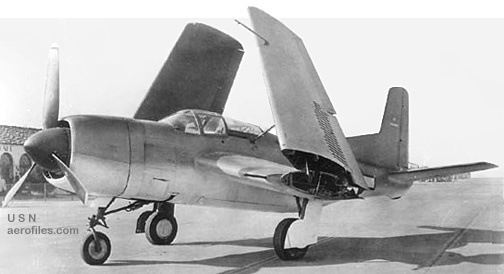 XA-20B 1941 = Conversion of A-20A with nose, ventral, and dorsal power turrets. POP: 1. A-20B 1941 = Revised glazed nose (of which many were field-modified in metal to house four to six additional guns), bomb bays modified for ferry tanks. POP: 999 [41-2671/3669], of which 8 to USN as BD-2. More than half the production to USSR as Lend-Lease. A-20C (Douglas, Boeing) 1942 = The first model used in combat; length: 47'3" load: 5375# v: 314/280/100 range: 745 ceiling: 25,230'. $124,253; POP: 808 [41-19088/19462, 42-32951/33383], plus 140 by Boeing [41-19589/19728], included 200 to RAF as Boston IIIA. A-20D - Lightweight. Not produced. A-20E 1942 = 1690hp Wright R-2600. 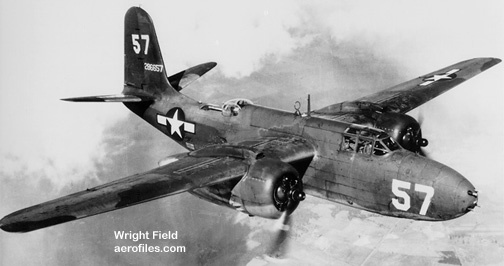 POP: 17 converted from A-20A. XA-20F 1942 = Modified A-20A with 37mm nose cannon and remote-control turrets. POP: 1. A-20G 1943 = Two 1675hp supercharged Wright R-2600-23; wing bomb racks, solid nose with various gun arrangements, some with bomb bay fuel cells; length: 48'0" load: 5987# v: 339/272/95 range: 1090 ceiling: 25,800'. $110,324, $100,800 in 1944; POP: 2,850 [42-53535/54284, -86563/86912], plus [43-9039/10237, -21252/22251] mixed with -20J. A-20H 1943 = 1700hp R-2600-29; load: 7145# v: 322. POP: 412 [44-001/825] mixed with -20K. A-20J 1943 = A-20G and -20H with glazed bombardier nose. POP: 451 [43-9039/10237, -21252/22251] mixed with A-20G, of which 169 to RAF as Boston IV. A-20K 1944 = Bombardier nose; length: 48'4" load: 3047# v: 333/269/100 range: 830 ceiling: 25,100'. POP: 413 [44-001/825] mixed with A-20H; 20 to RAF as Boston V.
XF-3, YF-3 1940 = A-20 modified as armed photo-recon. POP: 1 XF-3 [38-741], which went to USN as BD-1, and 2 YF-3 [39-745, -748]. TA-20 1945 = Trainer conversions of A-20H and -20J. A-24, F-24 Dauntless - USAAF dive-bomber version of USN SBD, minus folding wings and carrier gear. The "A" designation was dropped in 1950 and remaining A-24s were redesignated as F-24A/-24B fighter-bombers. A-24 1942 = Data same as SBD-3. $38,293; POP: 168 [41-15746/15823, 42-6682/6771]; the first block of 78 (aka A-24DA) was USN production diverted to USAAF minus carrier gear and folding wings, and the second batch of 90 was USN SBD-3A conversions. A-24A 1942 = Data same as SBD-4; 24v electrical. POP: 171 [42-6772/6831, -60772/60881, 48-044]. A-24B, RA-24B 1943 = 1200hp Wright R-1820; data same as SBD-5. RA- indicated a Restricted categorynot suitable for combat. POP: 616 [42-54285/54899, 48-045]. A-26, B-26 Invader - USAAF fighter-bomber; UNS version was JD. 3pChwM rg; Robert Donovan, Ed Heinemann, Ted Smith et al. Attack class was replaced in 1948 by Bomber, creating some confusion in sharing a prefix for a while of B-26 with Martin. Bomb loads: 3000-4000#. Service life extended into the Korean War, and in National Guard units up to 1961, then into the Vietnam War with On Mark conversions. Exports in the '50s to South American countries and France, Great Britain, Indonesia, Portugal, and Saudia Arabia. XA-26 1942 = First prototype. 2000hp P&W R-2800-27; span: 70'0" length: 50'0" load: 9850# v:370/212/100 range: 1800 ceiling: 31,300'; ff: 7/10/42. $224,498; POP: 1 [41-19504]. This same photo appears in Francillon's authoritative McDonnell Douglas Aircraft Since 1920 identified as XA-26-DE [41-19505], but an enlargement shows a tail number of "219504," which is enigmatic. The number might have been purposely altered for security reasons ([42-19504] was a Bell P-39Q), which was quite common at that time, but the disparity in model designations remains a mystery, as [41-19504] is XA-26 and [41-19595] as XA-26A in AAF registry. XA-26A 1942 = Second prototype as 2p night fighter. Solid nose with radar installation, remote-control turrets. POP: 1 [41-19505]. 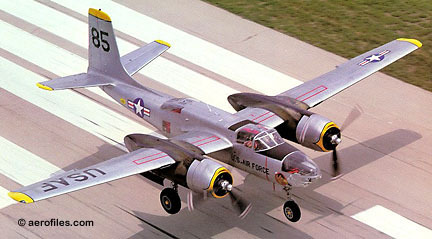 A-26A 1965 = Redesignation of modified B-26K. POP: 40. XA-26B 1942 = Third prototype; 75mm nose cannon. POP: 1 [41-19588]. 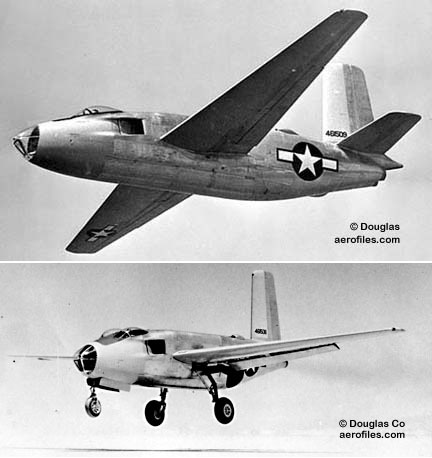 A-26B, B-26B 1942 = First production; 3pChwM; two P&W R-2800-71/-79; span: 70'0" load: 12,630# v: 355/284/100 range: 1400. Six .50 nose guns, later increased to eight, plus three dorsal and ventral remotely-controlled turrets with twin .50s. $254,624 in 1943, $192,457 in 1944; POP: 1,355 [41-31900/39151, -39153/39192, -39194, -39196/39198, -39201/39599, 43-22252/22303, -22305/22307, -22313/22345, -22350/22466, 44-34098/34585, -34587/34753, -34776]. Redesignated B-26B in 1948. CB-26B, VB-26B c.1958 = Cargo and staff-transport conversion. 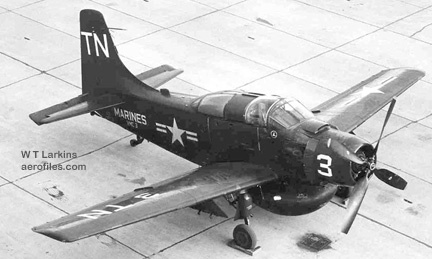 TB-26B 1955 = Trainer conversion for Natl Guard. A-26C, B-26C 1944 = Glassed bombardier nose or solid gun nose. 2360hp R-2800-79; length: 51'3" load: 15,050# v: 373/284/x range: c.900. POP: 1,091 [41-39152, -39193, -39195, -39199/39200, 43-22304, -22308/22312, -22346/22349, -22467/22751, 44-31798/31996, -35198/35357, -35358/35562, -35564/35947, -35955, -35957/35996], of which 88 to USN. Redesignated B-26C in 1948. FA-26C, RB-26C 1945 = Photo-recon conversion with turrets replace by radomes. Resignated RB-26C. XA-26D, -26DE 194? = Two 2100hp R-2800-83. POP: 1 [44-34776]. XA-26-DE SEE XA-26. A-26D - Production cancelled by war's end. XA-26E 1946 = R-2800-83: POP: 1 converted A-26C [44-35563]. XA-26F 1946 = Modified A-26B as the USA's first jet bomber. 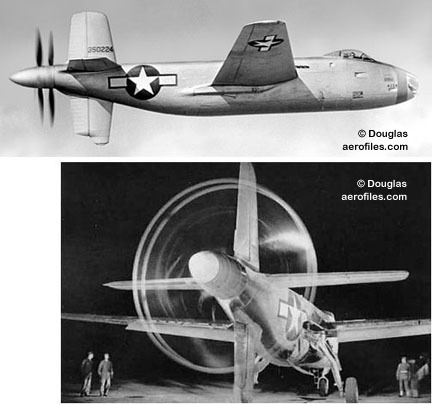 POP: 1 with experimental installation of a GE J31 turbojet in the aft fuselage in addition to its two four-blade R-2800-83s to give a 433 mph airspeed [44-34586]. DB-26J - Redesignation of USN JD-1D in 1948. UB-26J - Redesignation of USN JD-1. B-26K Counter-Invader 1964 (On Mark) = Vietnam counter-insurgency version rebuilt under USAF contract by On Mark (Los Angeles CA) from WW2 surplus; 2500hp R-2800. 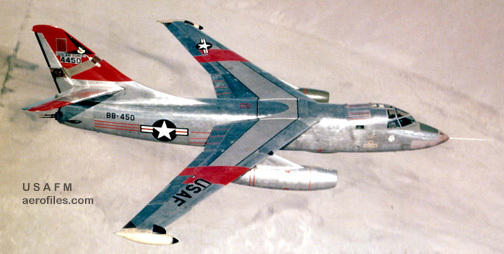 POP: 40 [64-17640/17679], redesignated A-26A in 1965. The first on permanent display at Ellsworth AFB Museum [44-35896=64-17640=N267G=N2294B]. Civil units were also converted by On Mark with redesigned fuselage as 6-12p Marketeer series and pressurized Marksman executive transports. A-33 (Northrop) 1940 = Residual production of 8A-5, scheduled for export to Norway, requisitioned by USAAF after the fall of that country. POP: 31 used as advanced trainers [42-109007/109019, -13584/13601]  most reported as later exported to Peru AF. A2D Skyshark 1950 = 1pClwM rg; 5100hp Allison XT-40A turbo with six-blade contrapropsthe first aircraft so equipped; span: 50'0" length: 54'0" load: 3280# v: 442/276/94 range: 2200; ff: 5/26/50. Mechanical problems led to cancellation of contract. POP: 2 prototypes as XA2D-1 [122988/122989], 10 as A2D-1 [125479/125488]. A3D Skywarrior - First USN carrier-based strategic bomber. 3pChwM rg. Shoulder wing. Also accepted by USAF, who used it as basis for B-66 design. Redesignated as A-3 in 1962 (qv). XA3D-1 1952 = Prototype with 7000# Westinghouse XJ40-WE-3 turbojet, soon replaced with P&W J57; span: 72'6" length: 74'8"; ff: 10/28/52 (p: George Jansen). Ed Heinemann, et al. POP: 2 [125412/125413]. YA3D-1 1952 = Prototype. POP: 1 ; redesignated YA-3D. A3D-1 1953 = Production model with 10000# P&W J57-P-6; span: 72'6" length: 74'5" v: 621/585/149 range: 1150 ceiling: 40,500'; ff: 8/16/53 (?>9/10/53). POP: 50 [130352/130363, 135407/135444]. Entered service in 1956. A3D-1P 1952 = Modified for photography. POP: 1 prototype ; became RA-3A. A3D-1Q 195? = Modified for electronics countermeasures; bombing systems removed. POP: 5 [130356, 130360/130363], became EA-3A. A3D-2 1956 = Originally designated A3D-1B; 10500# J57-P-10; span: 72'6" length: 75'8" v: 643/528/143 range: 1380 ceiling: 41,500'. Nuclear capability; 20mm tail turret "stinger." POP: 164 [138902/138976, 142236/142255, 142400/142407, 142630/142665, 144626/144629, 147648/147668]. A3D-2P 1958 = Photo-recon with 12 camera stations. POP: 30 [142256, 142666/142669, 144825/144847, 146446/146447]; redesignated as RA-3B. A3D-2Q 1959 = 7p electronics countermeasure, radar search. POP: 25 [142257, 142670/142673, 144848/144855, 146448/146459]; redesignated as EA-3B. 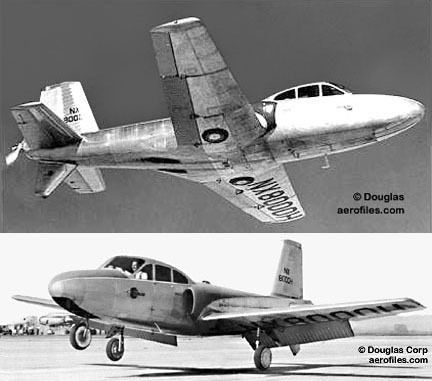 A3D-2T 1960 = Trainer. POP: 12 [144856/144867]; redesignated as TA-3B. A3D-2W - Designated , but not built. A3D-2Z 19?? = POP: 1 conversion from A3D-2Q . A4D Skyhawk - 1pClwM rg; 7200# Wright J65-W-4; span: 27'6" length: 39'5"; load: 14,650# (5000#+ ordnance) v: 673/410/x range: 2520 ceiling: 38,000'. Ed Heinemann, et al. Redesignated as A-4 in 1962. XA4D-1 1954 = POP: 1 prototype with J65-W-16A ; ff: 6/22/54 (p: Robert Rahn). Retained by Douglas for various tests and mods. A4D-1 1954 = POP: 165 [137813/137831, 139919/139970, 142142/142235]; ff: 8/14/54. The first 19 originally designated as YA4D-1 in test programs, Redesignated in 1962 as A-4A. set a 500k closed-course world speed record at Edwards AFB on 10/15/55 of 695.163mph (p: USN Lt Gordon Gray). A4D-2 1956 = Pressurized fueling system; 7700# J65-W-16A; ff: 3/26/56 (p: Dru Wood). POP: 542 [142082/142141, 142416/142423, 142674/142953, 144868/145061]; redesignated as A-4B. A4D-2N 1958 = Long-nose all-weather night fighter; ff: 8/21/58. Two to Army in 1961 for evaluation as a low-level attack fighter, but tests were abandoned and the support role was retained by USAF. POP: 638 [145062/145146, 147669/147849, 148304/148317, 148435/148612, 149487/149646, 150581/150600]; s/ns [146460/146693] cancelled. Redesignated as A-4C. 100 modified in 1969 as A-4L. A4D-3, -4 - "Low-budget" planned economy versions; s/ns [145147/145156] applied, but contract cancelled. A4D-5 19?? = 8500# P&W J52-P6A, added weaponry. POP: 742 [148613/148614, 149647/149666, 149959/150438, 151022/151261]; redesignated as A-4E. CA4F 19?? = Licensed Canadian manufacture. AC-47 1961 = C-47 as deadly air-ground gunship in Vietnam. Dubbed "Puff the Magic Dragon." 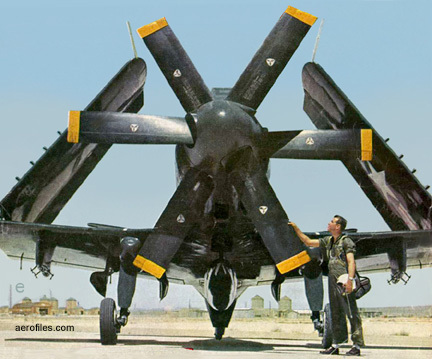 AD, A-1 Skyraider - 1-10pClwM rg. Dubbed "Spad" and "Sandy" by pilots. At the end of production in 1957, a total of 3,180 ADs had been produced. Used by all services in multiple roles: night/day fighter, attack bomber, trainer, early warning, electronics countermeasure, ambulance, personnel transport, troop carrier, photo-recon, cargo. AD-1 1946 = 1p redesignated from XBT2D-1. 2500hp Wright R-3350; span: 50'0" length: 39'5" load: 3407# v: 357/164/83 range: 1425 ceiling: 26,000'. POP: 242, of which 2 were modified as AD-1N and 1 as AD-1W. AD-1N 1947 = Conversion from AD-1. POP: 1. AD-1Q 1947 = Radar jammer. POP: 35. XAD-1W 1947 = Conversion from AD-1. POP: 1. XAD-2 1947 = POP: 1 converted from XBT2D-1; crashed before delivery. AD-2 1948 = 2700hp Wright R-3350; span: 50'0" length: 38'2" load: 5722# v: 321/198/83 range: 915 ceiling: 27,500'. POP: 156. AD-2Q 1948 = Strengthened gear, dive brakes. POP: 22. AD-3 1948 = Strengthened internal structures. Data similar to AD-2. POP: 125. AD-3N 1949 = POP: 15. 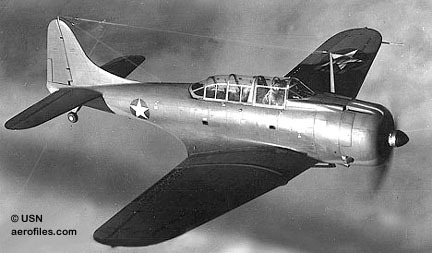 AD-3Q 1949 = 2p countermeasure duties, redesigned cockpit; ceiling: 36,000'. POP: 23. Originally designated AD-3QU. AD-3W 1949 = Sub hunter with radar bubble under fuselage. POP: 31, of which 2 became AD-3E for radar testing. AD-4 1950 = 2p with 2700hp Wright R-3350; load: 5750# v: 321/202/85 range: 900 ceiling: 36,500'. P-1 autopilot, four 20mm wing guns, redesigned canopy. POP: 236. 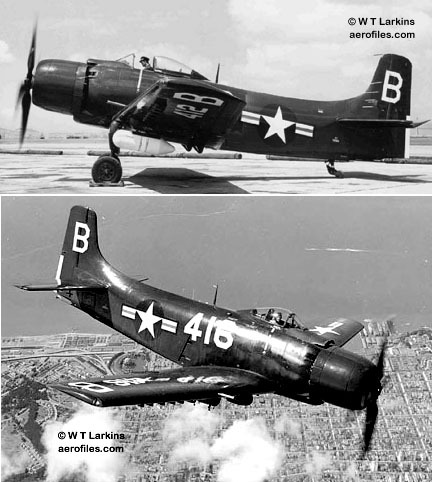 AD-4B 1952 = POP: 165 conversions from AD-4. One lifted a gross weight of 26,739#, twice its design load limit, and set new world record for single-engine aircraft. AD-4L, -4NL 1951 = Korean winterized version of AD-4. AD-4N, -4NA 1950 = Fuselage-side air brakes replaced by door to radar operator's cabin. POP: 307. AD-4Q 1949 = POP: 39. AD-4W 1950 = Pod-carrying sub hunter similar to AD-3W. POP: 69, plus at least 50 to RNAS as AEW-1 in 1951 (?>records show only 48). AD-5, A-1E 1951 = 2-10p similar to AD-3 with increased armament, fuselage modifications, enlarged tail and cockpit; span: 50'1" length: 40'1" load: 6486# range: 950 ceiling: 26,000'; ff: 8/17/51. POP: 213. Became A-1E in 1962; adopted by USAF in 1964. AD-5N, A-1G 1953 = 4p night attack with wide fuselage and enlarged tail. POP: 239. Became A-1G in 1962. AD-5Q, EA-1F 1953 = Modified from AD-5N. POP: 1 prototype, 53 conversions. Became EA-1F in 1962. AD-5W, EA-1E 1953 = USAF. POP: 218. Became EA-1E in 1962. AD-6, A-1H) 1953 = Standard attack configuration; 2700 R-3350-26WA; span: 50'2" length: 39'3" (?>38'10") load: 6138# v: 322/198/x range: 1316 ceiling: 28,500'. POP: 713. Became A-1H in 1962. 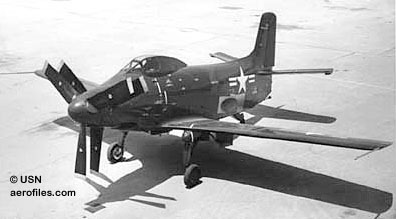 AD-7, A-1J 1956 = Strengthened gear and wing spars. POP: 72, the last one off the assembly line in Feb 1957. Became A-1J in 1962. AH-64 Apache, Sea Apache (McDonnell Douglas) 1975 = CH. Hughes H-64 as Army anti-armor and attack craft. Sea Apache was 1980 study for shipborne operations. AV-8A Harrier (McDonnell Douglas/BAe) 1971 = STOL CAS attack fighter for USMC. AV-8B Harrier II (McDonnell Douglas) 1979 = Modified AV-8A with LERX, new weapons system, new wing and canopy. For USMC. B-7 - USAAC bomber. 3pOhwM rg; two 600hp Curtiss V-1570C Conqueror; span: 65'3" length: 45'11" load: 2434# v: 182/158/78 range: 410-632 ceiling: 20,400'. Fabric-covered gull wings, metal-clad fuselage. XB-7 1931 = Prototype with corrugated fuselage and tail skin. POP: 1 [30-228], redesignated from XO-36. Y1B-7 1932 = Non-corrugated skin. 640hp V-1570-33 or 675hp -52 POP: 7 [32-308/314]. B-18A 1938 = Redesigned nose section, dorsal turret, 1000hp R-1820-53; length: 57'10"; ff: 4/15/38. The bombardier perched above and ahead of the nose gunner. Transparent, domed top on the fuselage turret. $63,977; POP: 217, of which 122 converted to B-18B; 20 to RCAF as Digby Mk I for North Atlantic sub patrol. B-18B 1940 = Conversion of B-18A into sub hunter; radio upgrade. POP: 122 modifications. B-19, -19A 1941 = 11-18pClwM rg; four Wright R-3350; span: 212'0" length: 132'4" load: 55,569# v: 224/135/73 range: 7710 ceiling: 23,000'; ff: 6/27/41 (p: Maj Stanley Ulmstead). From Wright Field designation original XBLR-2. Used in cargo and transport role during WW2. POP: 1 as XB-19 [38-471]; refitted with 2600hp Allison V-3420-11 (v: 265/185/x range: 4200 ceiling: 39,000') and redesignated XB-19A. Scrapped June 1949. B-22 - B-18A design study with 1600hp Wright R-2600-1; none built. B-23, UC-67 "Dragon" 1939 = Redesigned B-18A. 6pClwM rg; two 1600hp Wright R-2600-3; span: 92'0" length: 58'5" load: 7441# v: 282/210/80 range: 1450 ceiling: 31,600'; ff: 7/27/39. The first US bomber to have a tail turret, tests showed it to be slower and less well-armed than B-25 and B-26, so it never made it to combat. Used instead during WW2 in coastal anti-sub patrol, also in preliminary glider pick-up trials. POP: 38 [39-027/064], of which 12 were converted to glider tugs, and about 18 became 14p UC-67 transports in 1942 [39-029, 031, 034/035, 039, 041, 043/044, 047, 054/059, 061, 063/064]. "Dragon" was a popular name, never assigned by the USAAC. B-31 (Model 423) 1941 - Four-engine heavy bomber design project as XB-31, to compete with Boeing B-29, Lockheed B-30, and Convair B-32; none built. B-42 "Mixmaster" 1944 = Originally A-42 on paper. 2pCmwM rg; two Allison V-1710-125 pushers; span: 70'6" length: 53'7" load: 12,320# v: 410/344/x (?>380/250/x) range: 1840 ceiling: 29,400'; ff: 5/6/44 (p: Bob Brush) at Palm Springs CA. Coaxial props. POP: 2 as XB-42 [43-50224/50225]. First prototype later modified as XB-42A with two V-1710-33 pushers + two 1600# Westinghouse 19B-2 in underwing jet pods; span: 70'7" length: 53'10" v: 488/251/x range: 4750 ceiling: 35,500'; ff: 5/27/47 at Edwards AFB. "Mixmaster" was a popular name, never assigned by the USAAF. B-43 1946 = 3p B-42 with two 3750# GE J35 turbojets; span: 71'2" length: 51'5" v: 507/420/x range: 1300 ceiling: 41,500'; ff: 5/17/46 (p: Bob Brush, Russell Thaw). First USAF jet bomber, never entered production. POP: 1 each as XB-43 [44-61508] and YB-43 [44-61509] (ff: 5/15/47). Program was scrapped in early 1952, but much data gained from tests went into subsequent development of jet technologies. B-66 Destroyer 1954 - USAF tactical light bomber and reconnaissance, redesigned from USN A3D. 3pChwM rg; two 9700# Allison J71-A-11; span: 72'6" length: 75'2" load: 35,631#. Remotely operated tail guns. RB-66A 1954 = Evaluation models; ff: 6/28/54 (p: George Jansen). POP: 5 [52-2828/2832]. 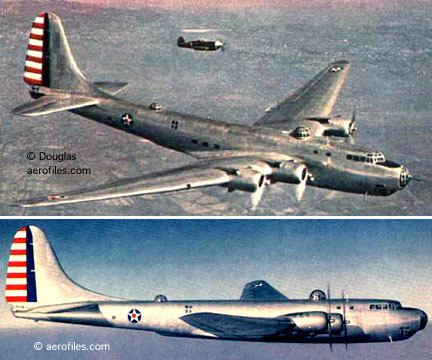 B-66B 1955 = Specific bomber version; 10200# J71; load: 27,631#; ff: 1/4/55. POP: 72 [53-482/507, 54-477/505, -548/551, 55-0302/0314], including conversions to EB-66B, NB-66B, and EB-66E. 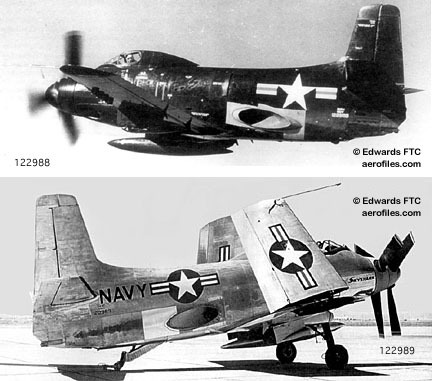 NB-66B 1955 = POP: 2 conversions of B-66B and RB-66B [53-413, -488]. RB-66B 1955 = Production model. POP: 145 [53-409/481, 54-417/446, -506/547], including conversions NB-66B and EB-66E. NRB-66B 19?? = Converted from RB-66B for engine testing. POP: 1 [53-421]. RB-66C 1955 = Electronic recon with radomes; ff: 10/29/55. POP: 66 [54-447/476, 55-384/389]. WB-66D 1957 = 5p weather recon; no tail guns. POP: 36 [55-390/425]. Of these 2 were rebuilt as Northrop X-21A boundary-layer control research aircraft in 1963. EB-66E 195? = Electronic reconnaissance conversion of B-66B. POP: at least 14 [53-440, -480, -482, et al]. BD - USN acquisitions of A-20/XF-3 with similar data. BD-1 1939 = Ex-USAAF XF-3 [38-741] as target tug. POP: 1 . BD-2 1940 = Ex-USAAF A-20B as general utility and cargo. POP: 8 [7035/7042]. BLR - XBLR-2 was Wright Field designation for prototype B-19, but it never flew under this designation. BT-1 1931 = USAAC basic trainer conversion from O-2K. POP: 40 [29-413/432]. BT-2 1932 = Conversion of existing O-32s to USAAC basic trainer. POP: 1 [29-218]. BT-2A 1936 = Production version; span: 40'0" length: 31'2" load: 1038# v: 133/113/x ceiling: 19,000'. POP: 30 [30-196/225]. 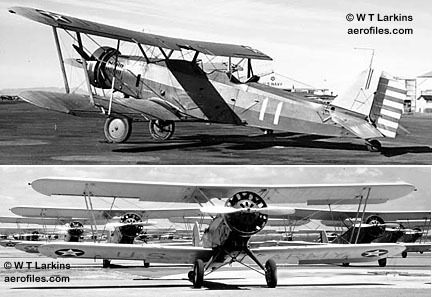 BT-2B 1932 = First USAAC basic trainer with that designation was similar to O-38 but with 450hp P&W R-1340-11. POP: 146 [31-001/146], included 1 experimental with pontoons [31-034]. BT-2BI 1932 = BT-2B as instrument trainer, included blind-flying hood. POP: 58. BT-2BR, -2BG 1940 = Initial designation for unmanned radio-controlled aerial target conversions of BT-2B/-2BI. POP: 2 as BT-2BR and 15 as -2BG. Became A-4. 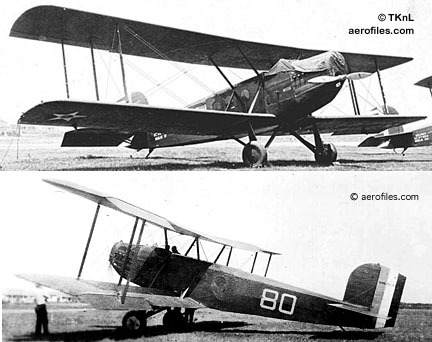 BT-2C 1932 = Second production; length: 30'4", revised landing gear. POP: 20 [31-439/458]; became BT-2CR. BT-2CI 1932 = BT-2C as instrument trainer. POP: 13. BT-2CR 1940 = BT-2C modified as drone controller for A-4 aerial targets. POP: 7. BT-30, T-30 - Proposed trainer to replace AT-6/SNJ. Engine amidships. 1948 design project only, none was built. 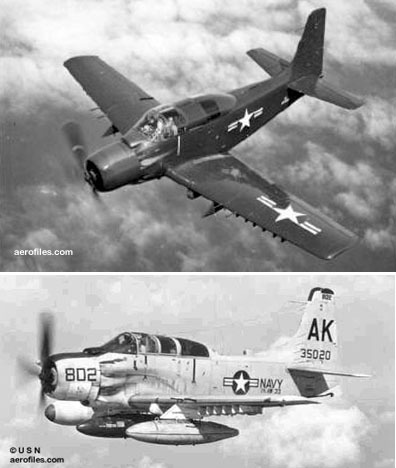 BT2D Skyraider 1945 = USN. 1pClwM rg; 2500hp Wright R-3350; span: 50'0" length: 39'5" load: 3407# v: 357/164/83 range: 1425. Leo Devlin, Ed Heinemann, Gene Root; ff: 3/18/45 (LaVerne Brown). POP: 25 as XBT2D-1, included 1 each test modification as -1P and -1Q, and 2 as -1N. Redesignated as AD-1 in 1946. BTD Destroyer 1944 = USN. 1pCmwM rg; 2300hp Wright R-3350; span: 45'0" length: 38'7" load: 5240# v: 344/188/92 range: 1480; ff: 3/x/44. Ed Heinemann, design developed from XSB2D. POP: 28 as BTD-1 [04960/04971, 09048/09062, 04959]. C-1 Transport 1925 (14) = 10pO/CB; 435hp Liberty V-1650-1; span: 56'7" length: 35'4" load: 2607# v: 116/85/46 range: 600 ceiling: 14,850'; ff: 5/2/25. Side-by-side open cockpit, eight-seat cabin convertible to 2500# freight load. Evolved from Army DWC World Cruiser. Although built primarily for the Air Service under this designation, a few were used in civilian roles under (14). $19,000; POP: 10 [25-425/434]. C-1A 1926 = 420hp geared V-1650-5 and larger rudder, also tested with skis. POP: 1 conversion [25-426]. C-1B - Projected, but not built. 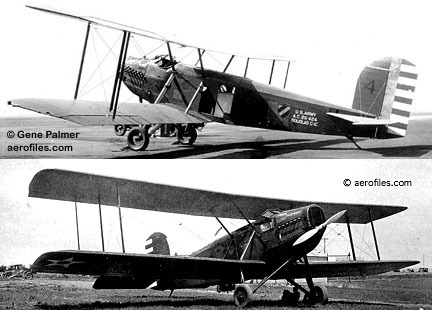 C-1C 1926 = Modified undercarriage and rudder, ambulance options; span: 60'0" length: 36'0" load: 3512# v: 121/85/45 ceiling: 15,950' POP: 16 [26-421/427, 27-203/212]. C-7 Globemaster III SEE McDonnell Douglas C-7. C-10 SEE McDonnell Douglas KC-10. C-21, FP-1 - Army and USN versions of Dolphin. Most were converted to stainless steel wings in 1936. USN version RD. Y1C-21, OA-3 1932 = 7p with 350hp P&W R-985 and 350hp Wright R-975-3. POP: 8 [32-279/286]. 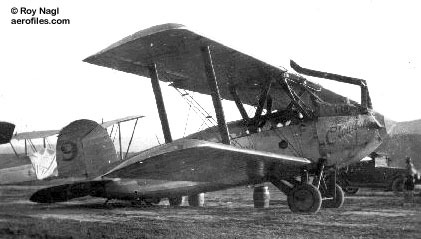 Converted to 4p amphibians as OA-3 in 1933-34. Temporarily redesignated FP-1 for Treasury Dept use. C-26, FP-2, OA-4 1932 = Army Dolphin. 8p with 300hp P&W R-985. POP: 2 as Y1C-26 [32-396/397]. 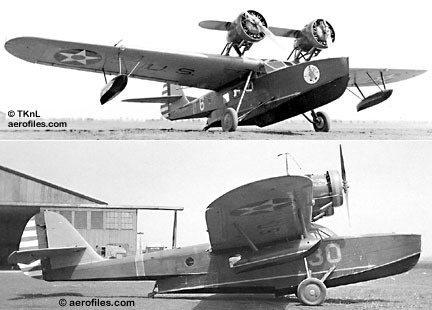 Converted to 4p amphibians in 1934 as OA-4. C-26A, OA-4A 1932 = 8p with 350hp P&W R-985-5. POP: 8 first as Y1C-26A, then C-26A [32-403/410]. Assigned to Treasury Dept briefly for Mexican border patrols and temporarily redesignated unique FP-2B. [32-403, -406/408] modernized to OA-4A in 1936. C-26B, OA-4B/-4C 1932 = 350hp P&W R-985-9. POP: 4 [33-294/297]; redesignated as OA-4B, then converted to metal wings as OA-4C; 1 with experimental tri-gear. C-29 1933 = Army Dolphin with 575hp P&W R-1340. POP: 2 [33-292/293], both later converted to C-29A. C-32 1934 = Military version of DC-2. XC-32 1936 = GHQ command transport. POP: 1 [36-01], damaged in landing 9/4/42 and became a mechanics' school training aid. C-32A 1942 = Civil transports impressed by USAAF. POP: 24 [42-53527/53532, -57154/57156, -57227/57228, -58071/58073, -61095/61096, -65577/65579, -68857/68858, -70863, -83226/83227]. C-33 1937 = DC-2 with a DC-3 fin; cargo door parallel to the ground to facilitate loading. POP: 18 [36-070/087]. C-34 1942 = Civil transports impressed by USAAF. C-38 = The first C-33 modified at the factory as the sole C-38initially designated C-33A, extensive modifications warranted the new designation [36-070]. In turn it became the prototype C-39. C-41 1939 = POP: 1, a C-39 repowered and modified with narrow fuselage, shorter-span wings, and larger tail as C-41 [38-502] and 1, a stock DC-3A fitted with military instruments and two 1200hp P&W R-1830-21s, as C-41A [40-070], the first military derivative of the DC-3. C-42 1939 = No data. C-47 Skytrain 1942 - Military DC-3A; two 1200hp P&W R-1830; span*: 95'6" length*: 64'9" load (variable): 7800# v: 230/184/66 range (varied): 1600 ceiling: 24,000' (data is generic for most models). *Dimensions differ slightly from commercial DC-3. Production versions mostly had sidewall bucket-seats. Payloads were 27-30 combat-equipped troops, 18-24 litters, or 29,000# cargo. USN version R4D. 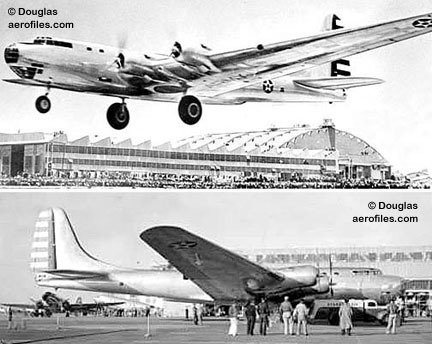 Suffixes -DL, -DK, and -DO on the C-47 series defined Long Beach, Oklahoma City, and Santa Monica factories respectively. C-47 (-DL) 1941 = 1200hp P&W R-1830-92. POP: 965 [41-7722/7866, -18337/18699, -19463/19499, -38564/38763, 42-5635/5704, -32786/32923, 43-30628/36639 (included USN R4Ds), 49-2612/2641 (included exports)]. C-47A 1941 = 24v electrical system. $128,761, $109,696 in 1942; POP: 5,253 (?>4,931) [42-23300/24419, -32924/32935, -92024/93158, 93160/93823, -100436/101035, -108794/108993 (included USN), 43-15033/16132, -30640/30761 (included USN), -47963/48262]. One tested as XCG-17 troop glider in 1944 with its motors removed, to be towed behind another C-47 [41-18496]. Motor mounts were sealed rather than removed, following a specification that the plane could easily be reconverted to power if needed, but this extra drag defeated the whole purpose of the plan. Otherwise, its performance as a glider was impressive. RC-47A 194? = Photo-recon modification. SC-47A 1962 = Search & reascue. VC-47A 19?? = Staff transport. C-47B 1942 = R-1830-90B/C with high-altitude blowers, added fuel tanks. $92,417, $88,574 in 1944, $85,035 in 1945; POP: 3,232 [42-93159, -16133/16432, -48263/49962 (included USN), 44-76195/77294, 45-0876/1139]. TC-47B 1942 = Navigator trainer. POP: 133 modified from C-47B batch at Oklahoma factory. XC-47C 1943 = Amphibious twin-pontoon experiment. POP: 1 [42-5671]. 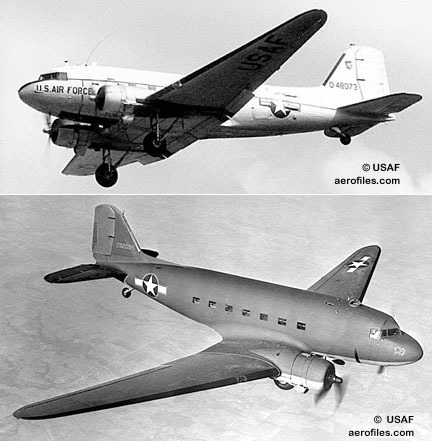 AC-47D, EC-47D 1953 = MATS conversions for navigation surveys. POP: 26, redesignated C-47D. RC-47D 19?? = Photo-recon modification for Korean War. VC-47D 19?? = Staff transport. C-47E - Engine upgrade program cancelled. YC-47F (Super DC-3) 1951 = Originally YC-129. 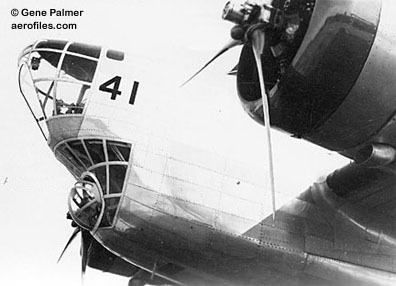 POP: 1 [51-3817], transferred to USN as R4D-8. C-48-DO 1941 = Impressed 21p civil DC-3A; two P&W R-1830-82. POP: 1 [41-7681]. C-48A 1941 = 10p with R-1830-82 or -51. POP: 3 [41-7682/7684]. C-48B 1942 = Civil DST sleeper. POP: 16 [42-38324/38326, -56089/56091, -56098/56102, -56609/566012, -56629]. C-48C 1942 = 21p DC-3A; R-1830-51. POP: 16 [42-38327, -38332/38338, -38258/38260, -78026/78028]. C-49-DO 1941 = Impressed civil DC-3 with two 1100hp Wright R-1820-79. POP: 6 [41-7685/7689, 7694]. C-49A 1941 = Wright R-1820-71. POP: 1 [41-7690]. C-49B 1941 = POP: 3 [41-7691/7693]. C-49C 1941 = Paratroop seating; 1200hp R-1820-71. POP: 2 [41-7715, -7721]. 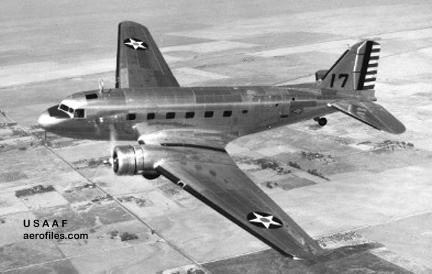 C-49D 1941 = Similar to C-49C. POP: 5 [41-7716/7720]. C-49E 1942 = R-1820-79. POP: 22 [42-43619/43623, -56092/56097, -56103/56107, 56617/56618, -56625/56627, -56634]. C-49F 1942 = Civil DST sleeper; R-1820-71. POP: 9 [42-56613, -56616, -56620/56621, -56623, -56628, -56633, -56636/56637]. C-49G 1942 = 1200hp R-1820-97. POP: 8 [42-38252, -38255, -56614/56615, -56630/56632, -56635]. C-49H 1942 = R-1820-97. POP: 19 [42-38250/38251, -38253/38254, -38257, -38328/38331, -57506, 65580/65582, 68687/68689, -102442, 44-83228/83229]. 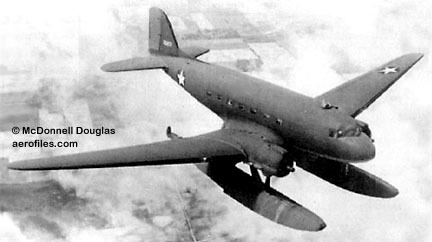 C-49J 1943 = Paratroop seating; R-1820-71. POP: 34 [43-1961/1994]. C-49K 1943 = Paratroop seating; R-1820-71. POP: 23 [43-1995/2017]. C-50-DO 1941 = Impressed civil DC-3; two 1100hp Wright R-1820-85. POP: 4 [41-7697/7700]. C-50A 1941 = Paratroop seating. POP: 2 [41-7710/7711]. C-50B 1941 = Right-side door; R-1820-81. POP: 3 [41-7703/7705]. C-50C 1941 = R-1820-79. POP: 1 [41-7695]. C-50D 1941 = Paratroop seating; R-1820-79. POP: 4 [41-7696, -7709, -7712/7713]. C-51-DO 1941 = Impressed civil DC-3; two Wright R-1820-83. POP: 1 [NC34962=41-7702]. C-52-DO 1941 = Impressed civil DC-3; two P&W R-1830-51. POP: 1 [41-7708]. C-52A 1941 = POP: 1 [NC19387=41-7714]. C-52B 1941 = POP: 2 [41-7706/7707]. C-52C 1941 = POP: 1 [41-7701]. C-52D 1942 = POP: 1 [42-6505]. C-53-DO Skytrooper 1941 = Impressed civil DC-3; two P&W R-1830-92. POP: 193 [41-20045/20136, 42-6455/6479, -6481/6504, -15530/15569, -15870/15894, -47371/47382, 43-14404/14405]. XC-53 1942 = Full-span slotted flaps. POP: 1 [42-6480]. XC-53A 1942 = POP: 24 [41-6455/6479]. 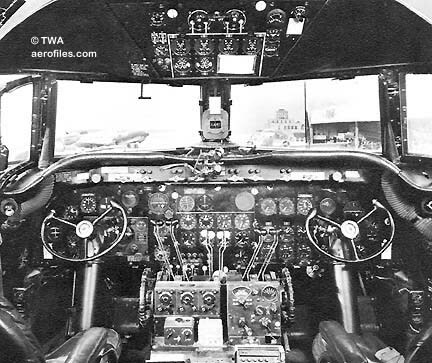 C-53B 1942 = Navigator station, added fuel tanks. POP: 8 [41-20047/20050, -20052, -20057/20059]. C-53C 1943 = Side seats. POP: 17 [43-2018/2034]. C-53D 1943 = Side seats. POP: 159 [42-68693/68851]. C-54 Skymaster 1942 = USAAF cargo version of impressed DC-4A with boom hoist and winch, fuselage fuel cells; convertible to 26p troop carrier; ff: 2/14/42 (p: John R Martin). POP: 34 [41-20137/20145, 42-32936/32950, 45-59602]. Popular use in MATS, Pacific Airlift, and Berlin Airlift. Evolved into C-114 and -116. C-54A 1942 = Four 1290hp P&W R-2000-7; span: 117'6" length: 93'10" load: 25,000# v: 265 range: 3900 ceiling: 22,000'. POP: 207 [41-37268/37319, 42-72165/72319, -107426/107470]. 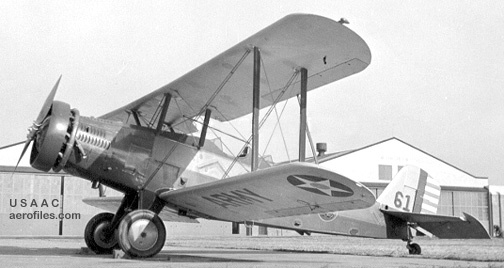 USN version R5D-1. C-54B 1943 = 50p. Integral fuel tanks in wings. POP: 220 [42-72320/72439, 43-17124/17129. 44-9001/9025], of which 30 to USN as R5D-2. One to RAF as executive transport for Winston Churchill as Skymaster I [43-17126=EW999]. C-54C 1944 = 15p presidential transport Sacred Cow for Franklin D Roosevelt, included an electric elevator for his use. Later used by President Harry S Truman. POP: 1 [42-107451], retired in 1961. VC-54C 1944 = Modified as staff transport. C-54D 1944 = Similar to C-54B but with R-2000-11. POP: 350 [42-72440/72764, 43-17199/17253], of which 86 to USN as R5D-3. AC-54D, EC-54D 195? = Modified for MATS Air Communications Service. POP: ??. Redesignated EC-54D in 1962. JC-54D 1960 = Modified for missile nose-cone recoveries. POP: 9. SC-54D, HC-54D (Convair) 1955 = Modified for SAR duties by Convair. POP: 38. Redesignated HC-54D in 1962. VC-54D 1944 = Modified as staff transport. C-54E 1944 = 24p executive transport. POP: 75 [44-9026/9150], of which 50 to USN as R5D-4. C-54F - Planned paratroop ship with double jump doors, modified from C-54D. Mock-up only as XC-54F. C-54G 1945 = 40-50p troop transport with 1450hp P&W R-2000-9. POP: 162 [45-476/637], of which 86 (?>13) to USN as R5D-5. 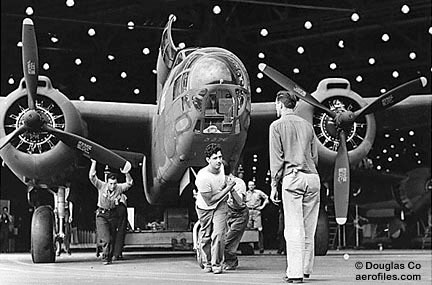 Components for 235 more [45-638/873] were transferred at the Armistice to civil DC-4 production. VC-54G 1944 = Modified as staff transport. C-54GM (Canada) 194? = License-built production by Canadair. 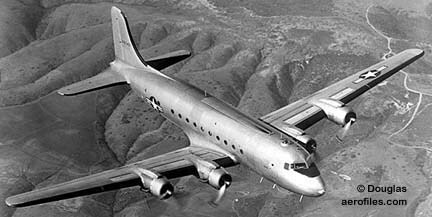 C-54H, -54J - Development cancelled by the Armistice. C-54K 1947 = Long-range development of C-54E with 1425hp P&W R-1820-HD. POP: 1. C-54L 1947 = C-54A modified with new fuel system. POP: 1. C-54M 1951 = C-54E stripped down to carry coal (yes, coal!). POP: 38 conversions as MC-54M. C-54N 1962 = Redesignation of USN R5D-1 to VC-54N. C-54P 1962 = Redesignation of USN R5D-2 to VC-54P staff transports. C-54Q 1962 = Redesignation of USN R5D-3 photo-recons and VC-54Q staff transports. C-54R, -54S 1962 = Redesignation of USN R5D-4 and -5 to VC-54S. C-54T 1962 = Redesignation of USN R5D-5 to VC-54T staff transports. C-54U 1962 = Redesignation of USN R5D-4 to EC-54U electronics countermeasure trainers. C-58 1940 = Transport version of B-18A. POP: 2. C-68 1942 = 21p civil DC-3A impressed by USAAF; R-1820-92. POP: 2 [42-14297/14298]. C-74 Globemaster I (Model 415A) 1945 = Developed from DC-4 (C-54). 125pClwM rg; four R-4360; span: 173'3" length: 124'2" v: 328/212/x range: 3400-7250 ceiling: 21,300'; ff: 9/5/45. Separate cockpits under side-by-side blisters. POP: 14 [42-65402/65415]; let contracts for 50 were cancelled by war's end. Evolved into C-124. C-84 1942 = Impressed 1934 model DC-3B; R-1820-71. POP: 4 [42-57157, -57511/57513]. C-110 1944 = Military use of DC-5. POP: 3 commercial transports impressed by AAF from Dutch operators in SW Asia [PKADB=44-83230, PKADD=44-83231, PKADC=44-83232]. ALSO SEE R3D. C-112 1946 = Military version of DC-6 with four 2100hp P&W R-2800-34. POP: 1 as XC-112A, redesignated to YC-112A. After service trials, it was surplused onto commercial airline service. 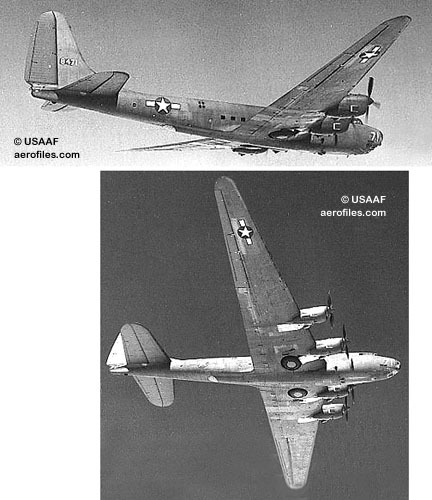 C-114 1945 = C-54G modification with four 1620hp Allison V-1710-131 inlines and 100'7" fuselage. POP: 1 [45-874]. Further development was not undertaken, but the concept evolved into Canadair C-54GM. C-115 - Projection with 1650hp Packard V-1650-209; not built. C-116 1945 = C-114 modification with thermal de-icers as YC-116 [45-875]. C-117 1945 = C-47B modified as 21p staff transport; some later redesignated as VC-117A and -117B. POP: 17 conversions [45-2545/2561]. C-117C was redesignation for VC-47, overhauled and brought up to C-117B standards; C-117D was redesignation from R4D-8. C-118 1951 = MATS DC-6A. 74pClwM rg; four 2500hp P&W R-2800W. POP: 101. SEE DC-6. C-124 Globemaster II - Four-motored military transport; 200pClwM rg. YC-124, -124A 1949 = 3500hp R-4360-20; ff: 11/27/49. POP: 1 converted C-74 [42-65410] (?>[42-65406]). Repowered with 3800hp R-4360-35As as YC-124A, again as -124B. C-124A 1950 = 3500hp R-4360-20WA; span: 173'3" length: 127'2" v: 298/264/x range: 6280. POP: 204 [48-795, 49-232/259, 50-1255/1268, 51-0073/0182, -5173/5187]. YC-124B 1954 = YC-124A repowered with 3500hp R-4360-35As; ff: 2/2/54. POP: 1 [51-072]. Refitted with 5550hp P&W YT34-P-6 turboprops as YKC-124B. C-124C 1952 = 3800hp R-4360-63A; span: 174'2" length: 130'5" load: 83,835# v: 304/230/x range: 6800 ceiling: 21,800'. De-icers, search radar; increased fuel and payload. POP: 243 [51-5185/5213, -7272/7285, 52-0939/1090, 53-0001/0105]. C-129 1951 = Interim designation for civil Super DC-3, became YC-47F. C-132 - Heavy transport project cancelled. C-133 Cargomaster - USAF/MATS logistics freighter; four 6500hp P&W T34-P-3/-7W turboprops. Fore and aft cargo doors for drive-through convenience. C-133A 1956 (Model DTS1333) = span: 179'8" length: 157'6" load: 160,310# (payload: 95,000#) v: 354/313/107 (?>331/300/x) range: 4258 (?>3975) ceiling: 19,400' ff: 4/23/56 (?>7/29/57). POP: 42 [54-135/146, 56-1998/2014, 57-1610/1615]. C-133B 1959 (Model 1430) = P&W T34-P-9W; clamshell rear doors; ff: 10/31/59. Gross wt: 286,000#. POP: 15 [59-522/536]. CG-17 1944 = Glider conversion of C-47 [41-18496] on which the engines were removed and the nacelles faired over; POP: 1 as XCG-17. While it outperformed conventional cargo gliders in all categories, there was no longer a need by that time for combat gliders. The plane was stored, then its engines were reinstalled, and it was surplused at war's end. Cloudster (Davis-Douglas) 1921 = 1pOB; 400hp Liberty 12; span: 55'11" length: 36'9" v: 120 range: 550 ceiling: 19,160'; ff: 2/24/21 (p: Eric Springer). The first airplane to lift its own weight in payload. Douglas' first commercial venture, designed to fly across the country, an endeavor that ended in Texas after an engine failure. POP: 1; sold in 1925 to Ryan Air Lines, where the fuselage was modified to hold 10 passengers and the plane proved quite successful in the role of an airliner, but when the business failed it went into charter work. In 1926, on a charter to Ensenada, Mexico, in a beach landing the pilot hit the surf and the damaged plane was abandoned to the incoming tide. Davis, principal financier of the new company, later gained fame in his own right as designer of the renowned Davis airfoil. Cloudster II (Model 1015) 1947 = 5pClwM rg; two 250hp Continental W-670 in tandem; span: 39'10" length: 35'5" load: 1885# v: 200/x/55 range: 950 ceiling: 22,500'; ff: 5/12/47 (p: Bob Brush, O B Paulson). Charles S Glasgow et al. Tail-mounted, 8' pusher prop was driven via Bell P-39 driveshafts from forward-mounted motors. POP: 1 [NX8000H], flew only twice. Stored for many years, it was finally donated to a local Boy Scouts troop for use as a training aid. Commuter 1926 = 2pChwM; 35hp Anzani or 60hp Wright-Gale; span: 37'3" load: 450# v (60hp): 76. Wooden construction, fabric covering; foldable wings. First airplane to make use of Clark-Y aerofoil, and first Douglas venture in the light aircraft field. POP: 1, c/n 150.